This is Andrew’s first book. It is a rich and colourful tapestry of images and stories collected over more than thirty years of flyfishing. The book is poetic and nostalgic in places, practical and technical in a few of the essays, and in general is a work of appreciation for the natural world through which the flyfisher moves. 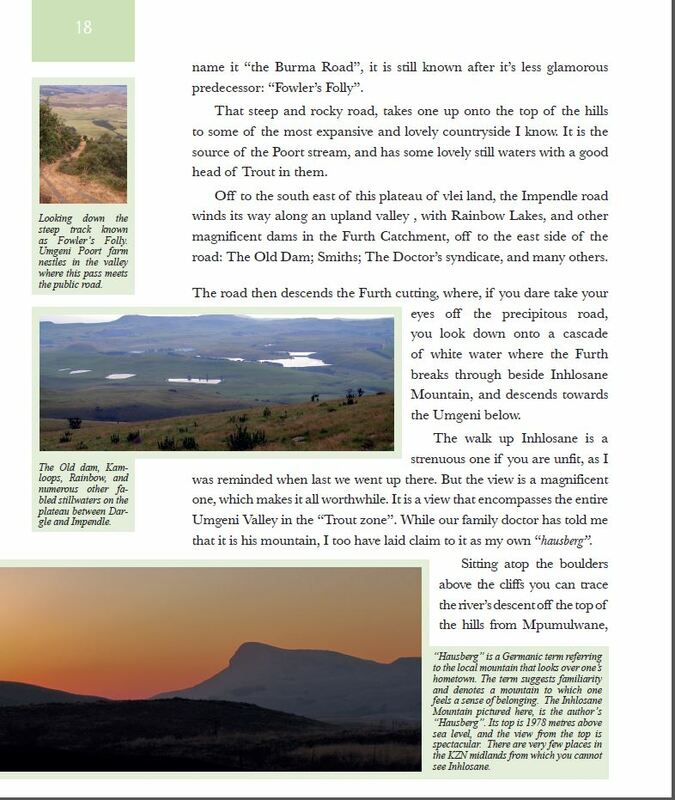 The proceeds of this first [limited] edition were donated to an environmental initiative in which the Worldwide Fund for Nature (WWF) , Duzi-Umgeni Conservation Trust (DUCT) and the Natal Fly Fishers Club (NFFC) worked together to restore a section of the Upper Umgeni River as a fishable Trout stream by removing wattle, bramble and logjams . The 310 page book contains over 250 colour photographs, which, coupled with the text, give the reader an appreciation for Andrew’s home waters and surrounding landscape. Andrew takes you through stories from his first Trout, to schoolboy mischief with a fly rod, to his own poetry and more. Second edition softcover books are still available. I’ve been meaning to write to you to say how much I enjoyed your book. It made me extremely homesick for the waters of KZN which I spent so much time exploring, and which I love so much. I share your deep sense of attachment to place and the intimate knowledge which one builds over many years, but yours far outstrips mine of the midlands region. I also learned a huge amount, though you manage to impart information with a light and deft touch.